With a program of 50 level crossing removals planned for Melbourne, with many of them already underway, one would assume that the last thing that the government would be doing is building NEW level crossings. But yet again, a lack of planning is seeing money go down the drain – this time at Cardinia Road on the Pakenham line. Cardinia Road is a north-south thoroughfare on the western edge of Pakenham, connecting the Princes Highway and crossing the double tracked Pakenham railway line. Once a two lane country road that served the rural community of Cardinia, in the past decade suburban sprawl has caught up with the paddocks either side of Cardinia Road, driven by the opening of the Pakenham Bypass and associated freeway interchange in 2007. 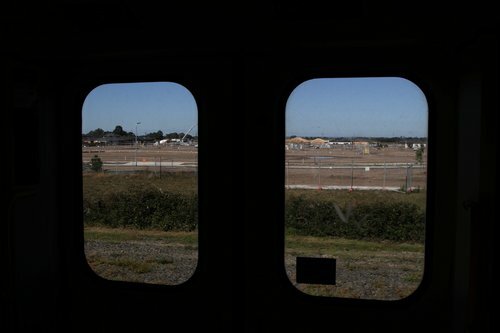 Public transport was forced to play catch up, with Cardinia Road station being opened to passengers in 2012. Surrounded by car dependant suburbs, the two lanes of Cardinia Road have been unable to cope with the flood of new residents. 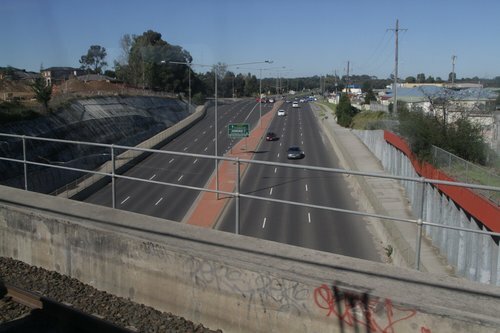 As a result, VicRoads commenced the Cardinia Road duplication project back in 2010. Cardinia Road is being duplicated to two lanes of traffic in each direction from Princes Highway to Pakenham Bypass. The upgrades include road widening, a new shared use path and a new pedestrian crossing. This road is an important north south route for the local community. These works will support growing traffic needs and improve safety and access along the route. We’re ready to start on the final section of duplication on Cardinia Road, from Shearwater Drive to the Pakenham Bypass. Construction will begin in March 2016 on the remaining upgrades for an estimated six months. The final stage now underway, with the new carriageway taking shape. But one hand of government has not talked to the other, as VicRoads has decided that duplicating the existing level crossing is an acceptable outcome. The Cardinia Road upgrade will include duplication of the road at the level crossing, and rail signal upgrades. The removal of the level crossing on Cardinia Road is not included in the scope of this upgrade, however our works will not prevent grade separation of the level crossing taking place in the future. The upgrade will provide immediate and significant benefits for those who use and live near Cardinia Road, including improved traffic flow and travel times. As part of the Cardinia Road upgrade, the rail signals will be improved to assist in reducing boom gate down time. Quite a cop out from VicRoads, given the current government focus on removing level crossings. What about other road projects? Many previous VicRoads road duplication projects that have resulted in level crossings being grade separated. 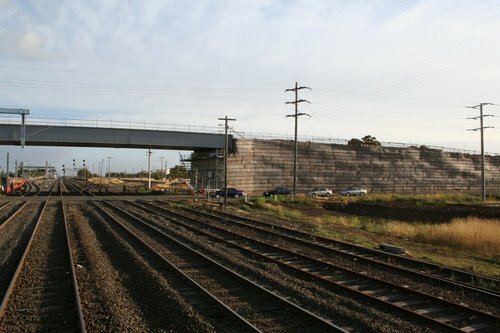 Narre Warren – Cranbourne Road at Narre Warren on the Pakenham line is one – in conjunction with duplication of the road, a new underline bridge was jacked into place over a single weekend in 2004. But a simpler solution is the staged construction of a road over rail bridge. The first example that comes to mind is Somerton Road at the Craigieburn railway line – duplicated and grade separated in 2007. And another is Kororoit Creek Road on the ‘express’ route to Werribee, duplicated and grade separated in 2011. Step 4: transfer traffic onto the new pair of bridges. Far simpler to build a bridge now, than to rip up Cardinia Road in a few years time, don’t you think? Thompsons Road is an essential freight and transport route that carries around 26,000 vehicles each day, extending from Mornington Peninsula Freeway, in Patterson Lakes, to Berwick-Cranbourne Road in Clyde North. With this number set to increase, the Victorian Government is going to add two lanes in for 10.7km to improve the connectivity for those who live and work in the region. This project also happens to involve a level crossing – but this time the message from VicRoads is different. We found that road over rail is the most appropriate solution for removing the level crossing due to the groundwater challenges in this area. Although the bridge design is yet to be finalised, it is likely to consist of two separate structures, both will feature three traffic lanes and a shared use path. This allows the bridge to be constructed in two stages, minimising disruption to road and rail users during the works. 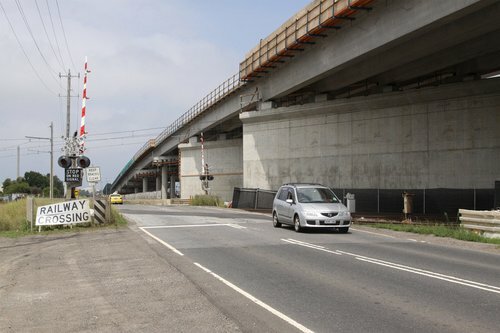 A curious decision from VicRoads – a road crossing the single track railway to Cranbourne warrants grade separation right now, while a road crossing the double tracked railway to Gippsland doesn’t. Taking the politics out of transport planning? We won’t pretend that Vic Roads is an independent statutory authority, will we. I am familiar with the area as my mother and brother live near there and it can only have been politically expedient to get a railway station built and the road widened. The other two major level crossings in the area can be bad with absurdly long wait times without a train passing, but I doubt the Cardinia Road crossing is a huge problem, yet. It will be though, and in time it will be done. Such things are always about money and votes with money directed to where the votes may come from. It’s a hard line to walk – spending $$$ upfront and “overengineering” for the future; compared to completing a good enough solution, spending the savings elsewhere, then spending more money at a future time. Before adding in the shortsighted of the duplication projects in the Pakenham area, which by the way if you think Cardinia road is bad you should have a good look at McGregor Road duplication for a real laugh. The problem with McGregor Road crossing which is the one with the absurdly long wait time, from what I gather is due to multiple movements into Pakenham during peak the lack of platforms and where the crossing circuits starts. Depending on the time and combination of the movements that crossing can be activated by the Down suburban which would just be sitting there held up by a signal at danger (mind you the crossing is already activated) as it waits for the Up suburban to depart, emptying the platform for the Down to arrive into, or waiting for the Up V/line Gippsland service to arrive into Pakenham, dwell for passengers to detrain/board and then depart which allows Down Pakenham suburban service to have a empty platform to terminated, this is why road uses can be stuck at that particular crossing for a good 10-15mins, also Main Street and McGregor Road crossings are tied together so even if the Down suburban service waits on the down side of that crossing for the cross, the crossing would still be activated. I guess further up the line many crossing include a few marked for removal soon has long wait times due to the very same scenario. Now back to why McGregor Road duplication is such a laugh, in regards to shortsightedness of why Cardinia road duplication not being grade separated is due to the can of worms it would open as McGregor Road duplication which recently finished isn’t grade separated, in fact you’ll find that road now goes from two lane into one at the crossing back into two now how’s that for a laugh, at least with Cardinia Road it’s both duplicated lanes through a crossing. As for Pakenham station, it’s a bit of a joke considering how much usage it gets – terminating trains and through V/Line trains have to fight over a pair of platforms, with low speed 40 km/h points linking the tracks, and signal aspects that slow down approaching trains unnecessarily. What do you think the most likely outcome will be when they do remove the crossing? I looked at the aerial map and honestly don’t think they would lower the railway line because it’s too close to Cardinia Rd station (I doubt they’d demolish a station only built 4 years ago). I also don’t think they’d put the road over or under because they’d do it from now. Perhaps the government will make a surprise announcement like they did about the partial duplication on the Altona Loop. I’d suspect any future grade separation will be road over – as you mention, dropping the tracks wouldn’t work, and the surrounding houses are some distance away, so NIMBY concerns should be few and far between.